Vegetable stew or kurma is an easy way to use up all the loose veggies languishing in your crisper and surreptitiously makes up the vegetable requirement in my family's meals. There are two kinds of vegetable stew. One that we make without any spice powders, getting its flavor from just green chilies, pepper and whole spices. 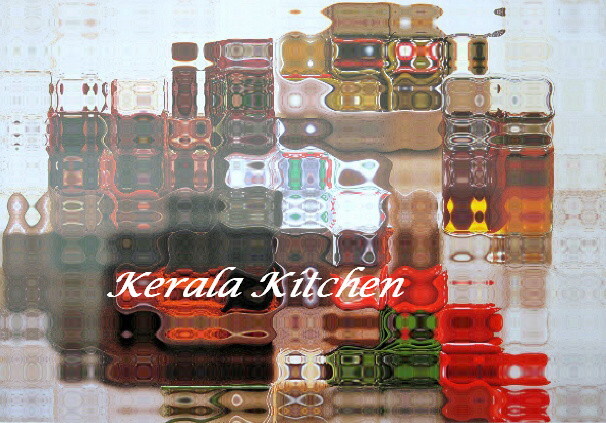 That is off white in color and delicate in flavor best eaten straight off the flame with a spongy appam or puttu. Traditionally this is made with just potatoes and onions. The other stew or ishtoo is a spicier version of the same, with an assortment of vegetables using coriander, turmeric and chili powders to give a depth of flavor and spice. My mother, being a purist would make the potato ishtoo over the vegetable stew, preferring the blend of coconut milk and potatoes to the myriad flavors of the vegetables. I prefer the spiciness to compliment the blandness of the puttu and to get vegetables in at one go. The choice of vegetables are usually potatoes, carrots, peas and beans, but you can also try with cauliflower, kovakka, ash gourd etc. Now kurma is a similar in recipe to the stew except that I understand it uses ground coconut and not coconut milk. Being partial to the silken texture of the coconut milk and the vegetables suspended in it, this is my version of the kurma. 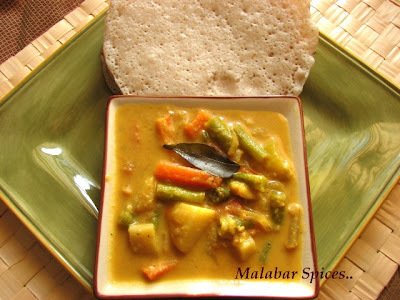 Call it a veg stew or kurma, it goes well with any kind of flat bread. 1. Wash and cut the vegetables into even sized strips or cubes. Slice the onions and green chilies. Grind the ginger and garlic into a fine paste. Grind the coconut and extract the second and first milk or use the coconut milk powder and prepare 1 ½ cup of coconut milk. 2. Heat the oil in a large shallow pan, add the whole spices and curry leaves. Saute till the fragrance fills the air and then add onions and chilies. 3. Fry onions till just slightly transparent and immediately add the ground paste and fry it well. Keep stirring and add the spice powders and a tablespoon of water to avoid the spices from getting burnt. Cook this for a couple of minutes or so. The coriander has to be really cooked at this stage or gives a raw taste in the curry. Then add the potatoes, tomatoes and continue stirring. Add 1 cup of water (or the second milk of the coconut) and the rest of the vegetables and salt. Cover and cook till the vegetables are done. (10-12 minutes) Keep checking and add 1/2 cup more water if all the water has evaporated. 4. Add the thick coconut milk. Allow it to simmer (but not boil) just for a couple more minutes and then switch of the flame. Adjust salt and seasoning. Serve hot with pathiri, appam, puttu or just paratha. Shown here are Kallappams, which I started making following Annita's recipe and I am in love with them. Appams are what I grew up with but now kallappams are a hot favorite in my house. Just follow Annita's recipe for Kallappam. 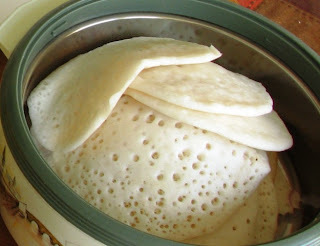 It is too good and easy to make in larger quantities than appams. Looks delicious Shaheen.You are too busy these days! :) Hope you are doing well. kallappam and korma..hmmmmmmmmmmm....enjoy shaheen..grrrrrrr..how do u manage to cook all these fabulous dishes everyday?? i wonder where u get all this energy from?! Thanks for searching for me. It feels really special to be missed. I am seriously contemplating quitting food blogging. I still cook, still love food and regularly visiting all the food blogs but I dont know whether i want to continue. There is one thing that is holding me back. the handful of dear dishes that amma used to make for me. I want to log those and call it quits. Those appams, unforgettable, takes me back to that trip to Chertala where I could have happily survived on loads of appams. the veggie korma looks delicious. Hi Shaheen, the kurma sounds wonderful with coconut milk. I am instantly craving some with those kallappams! What a lovely meal that must be. Shaheen, Another favourite recipe from your blog. I just love Appams period. slurp!! slurp!! Asha, Thanks for ur concern. I left a note for u in ur site. SAndeepa, No, I don't use coconut oil and just 2-3 tbsp of the milk powder. I further dilute it with regular milk to increase the gravy. Cholesterol is scary but sometimes its good to give in the tastebuds. Maneka, Hardly any energy.. I don't make this on adaily basis. Too busy balancing work and home., These are for the days on weekends when I feel relaxed. :)I would like more energy though. Revathi, I don't want u to stop completely. Anil, I haven't had the oppurtunity to eat the authentic stuff at chertala, envying you. Thanks Sushma, Hope u will try some. Surya, try this, u may like it if u liked the white stew. Shilpa, I guess curry powder is an easy way of making this korma as it does have all the masalas but the taste of whole spices is very different from ready powder. Seema, if only it didn't have the soaking, I would be making this more often. Linda, this is one of the ultimate comfort food from our place. You have to make it. Reena, I agree slurp slurp! Appam and Korma ..Nice combination..I tried Annita's Kallapam..Next time I will try with ur Korma.. I made iddiyappam and veggie kurma and for my housewarming party and it was a hit!! !